Microsoft releases two big feature updates a year for Windows 10. 2017 saw the arrival of the Creators Update in April, followed by the Fall Creators Update in October. The Creators Update was a slow and at times problematic release. A quarter of Windows 10 users still didn’t have it by the time its successor rolled out. Thankfully, Microsoft seems to have learned some important lessons, and the Fall Creators Update is being installed at a much faster rate. 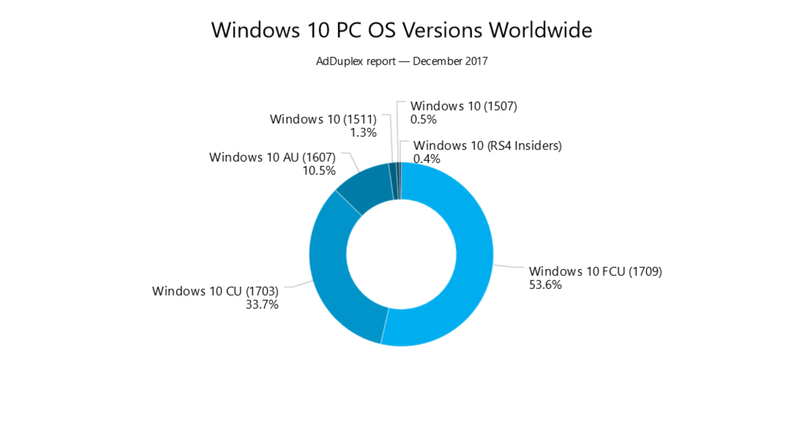 According to the latest figures from AdDuplex, a mere two months after it launched, the Fall Creators Update (1709) is already on more than half of the Windows 10 PCs in use -- 53.6 percent to be precise. That's up from 20.5 percent a mere month ago. 33.7 percent of users are now running the Creators Update (1703), with 10.5 percent on the Anniversary Update (10.5 percent). 1.3 percent are still on Windows 10 1511, and 0.5 percent are on Windows 10 1507. Windows Insiders running an early build of the next version of Windows 10 -- Redstone 4 -- account for 0.4 percent. As you might expect, Fall Creators Update adoption is faster in some countries than others. Canada and certain Western European countries lead the way, with upwards of 60 percent share. The US is at 56.9 percent and the UK at 57.2 percent. Adoption in African and South American countries is currently at ~30 percent.